'My hubby didn't even know it wasn't meat,' said one one reviewer of this taco salad made with BOCA Veggie Ground Crumbles. Cook crumbles and salsa in skillet on medium heat 5 min. or until crumbles are cooked through (160ºF), stirring frequently. Place lettuce on 2 plates; top with crumbles mixture and remaining ingredients. Sprinkle 2 Tbsp. 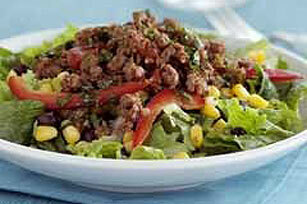 of your favorite KRAFT Shredded Mexican-Style Cheese and/or finely chopped red onions over each salad before serving. You should get about 2 Tbsp. lime juice from 1 medium lime.